Londolozi Pioneer Camp offers family friendly accommodation in a pristine wildlife area in the Sabi Sand Game Reserve. Londolozi Pioneer Camp is a classic safari style accommodation situated in the heart of African bushveld. This safari lodge in Africa offers comfortable accommodation in 3 exclusive suites and 3 river view chalets. Each room feature air conditioning. Look forward to spotting African wildlife in the pristine wilderness. Londolozi has traversing rights over 17 000 hectares of prime game viewing land and has exclusive rights over 7 000 hectares, ensuring guests excellent game viewing opportunities. Some of the African wildlife guests might spot during their Mpumalanga safari include Lion, Elephant, Antelope and Leopard. 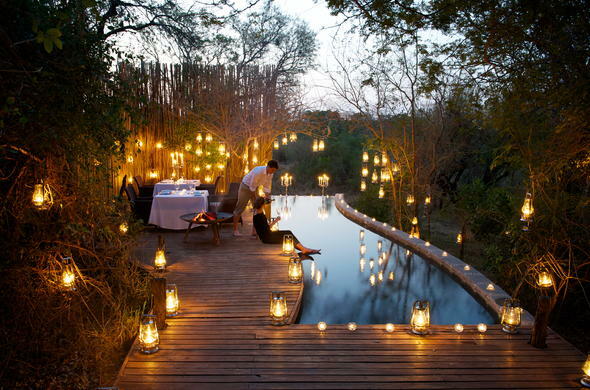 This safari lodge in Africa is located in the Londolozi Game Reserve. This reserve is situated in the scenic Sabi Sand Game Reserve which borders the famous Kruger National Park in Mpumalanga, South Africa. Children are welcome. Children 5 years and younger cannot participate in game drives. Child minders are available at an additional charge. Children aged 6-11 years are allowed on game drives at the discretion of the lodge manager. Please not that Londolozi Pioneer Camp is situated in a malaria area. Please consult your doctor prior to arrival regarding malaria prophylactics.